Life is filled with highs and lows. These are the moments that can dictate the course of your life. Life is also filled with seconds that turn into minutes that can be used in any way that you choose. Most people spend their precious time doing jobs and having lives that make them miserable. They have some “shadow” that seems to keep them from shining. It keeps them from truly utilizing their true potential. 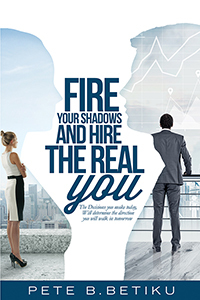 In Fire Your Shadows and Hire the REAL You! Pete Betiku explains that a shadow can be a person, place, emotion, or thing that is preventing you from stepping out of your comfort zone, and living the life that you were placed on earth to live. A shadow can be anything negative that is preventing you from embarking on a prosperous life. In this book, you’ll learn every step in the process of removing yourself from any shadow that is trying to be in your path. You’ll learn how to rise into your greatness, and step out of any shadow that might be covering you. You will learn all the tricks, and be given the tools that everyone—from world-class athletes to world leaders—use to live a life in which they are using their potential to exert their inner greatness. Your inner greatness just waiting to be released is the part of you that always lived in you, but some fear or doubt shadowed this greatness. Well, here is where we will bring out the REAL you, and you will fire a version of yourself that is now outdated—and hire the person who you always knew you would be.